Allie Dragoo wins stage 1 of the Tour of Utah Women's Edition Stage 1. Photo by Steven Sheffield. 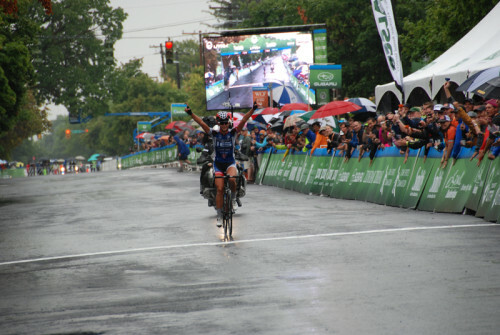 Allie Dragoo celebrates as she wins stage 1 of the Tour of Utah Women's Edition Stage 1. Photo by Steven Sheffield. 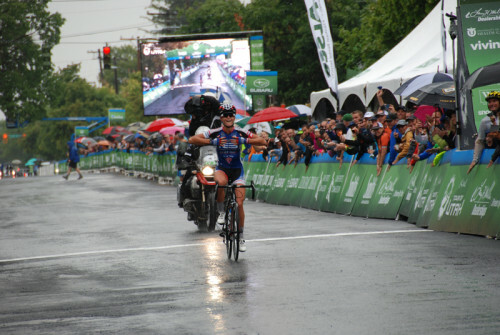 Allie Dragoo wins stage 1 of the Tour of Utah Women's Edition Stage 1 – Photo 3. Photo by Steven Sheffield. Allie Dragoo wins stage 1 of the Tour of Utah Women's Edition Stage 1 – Photo 4. Photo by Steven Sheffield. 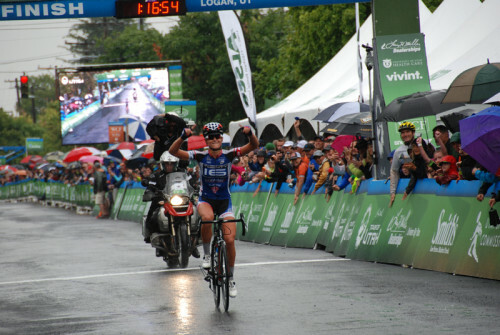 Tour of Utah Women’s Edition Stage 1 report by Steven Sheffield. There is a myth that women’s sport is not as exciting as men’s sport, but to the true fans, it doesn’t matter who is playing … the competition is always exciting, and this is as true if not even more so in women’s cycling. Today’s first stage of the Tour of Utah Women’s Edition was set to be an epic battle with a hilly 3km course in downtown Logan, climbing Canyon Boulevard, before a straight drop back down 300 North into a 90-degree left turn into the finishing straight. Conditions on the day made it that much harder, as the riders lined up in pouring rain which never let up. Attacks began from the gun, as local rider Breanne Nalder (DNA Cycling p/b K4 Racing) launched off the front on the first trip up the hill, holding the position for the first two laps, until the field was able to bring her back. Immediately the counter attacks started with various riders including Coryn Rivera (United Healthcare) trying to get a break together, and causing several splits in the field. After about 20 minutes of racing, Utah-transplant Allie Dragoo (Twenty16 p/b Sho-Air) launched her own solo flyer, with a group of 6 riders including Linda Villumsen (United Healthcare) and Olivia Dillon (Visit Dallas Cycling) about 20 seconds behind. As the race continued, Dragoo held on to her solo lead, widening the gap not only between herself and the chase, but going about a half of a lap on the rest of the field, taking several cash and omnium point primes along the way, while most of the field was pulled from race about the halfway mark, leaving just under 40 riders still on course. With 3 laps to go, it became obvious that Dragoo would not be brought back into the fold barring disaster, and the cat-and-mouse games began in the chase group to figure out who was going to take the sprint for second. 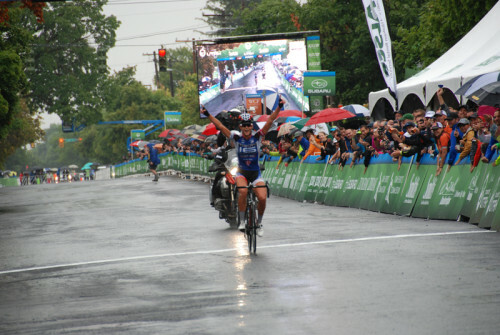 As the rain continued to fall, Dragoo widened her gap on the chase to about a minute, while the 6-rider chase had to contend with the 30-strong field closing the gap from behind. Coming into the final corner on the last lap, Dragoo kept pushing all the way to line, celebrating as she crossed with no one else in the photo. Gretchen Stumhofer (Colavita-Bianchi) gapped the rest of the chase in the last corner to finish second, 49 seconds behind Dragoo, while Linda Villumsen led home the remainder of the chase another 4 seconds further back, just pipping Alison Arensman (Twenty16) and Olivia Dillon on the line. Local favorites Mindy McCutcheon (Canyon Bicycles-Shimano), Janalynn Luttrell (Roosters-Bikers Edge), and Breanne Nalder (DNA Cycling) all finished in the main field about 1:45 behind Dragoo. 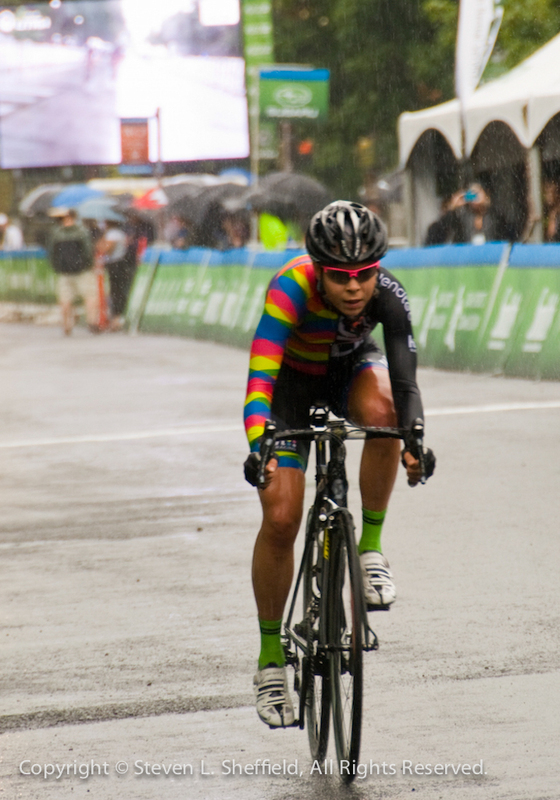 Breanne Nalder in the 2015 Tour of Utah Women's Edition Stage 1. Photo by Steven Sheffield. 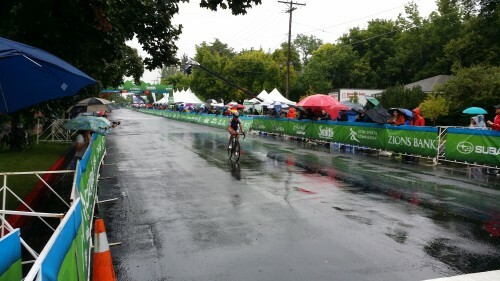 2 Responses to "Dragoo Wins Tour of Utah Women’s Edition Race 1 – Results, Report, Photos"